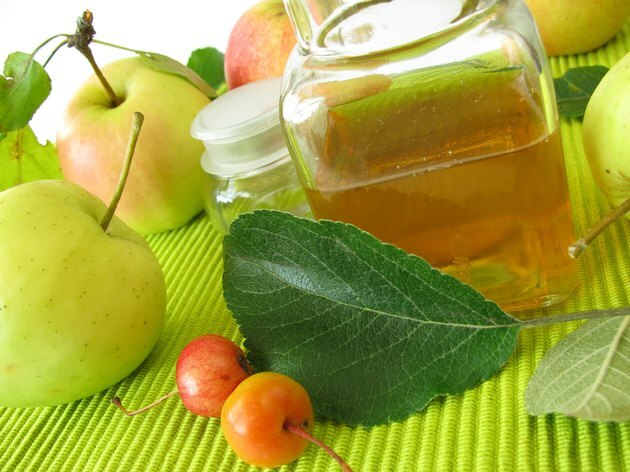 Apple cider vinegar is made from apples and used in various culinary or medicinal applications. Manufacturers make it by smashing apples, adding yeast to ferment the apples into alcohol and then treating the alcohol mixture with special bacteria. These bacteria consume and convert the alcohol into acetic acid, which can have both positive and negative effects on your gastrointestinal health. The Environmental Protection Agency reports that acetic acid is the primary active ingredient in vinegar, with regular table vinegar containing around 5 percent acetic acid and 95 percent water. Registered dietitian Carol Johnston states that all vinegars in the United States must have a minimum of 4 percent acidity. Apple cider vinegar may have as much as 6 percent acidity, however. If the vinegar you are consuming is too acidic, it may be causing stomach pain. If you are experiencing pain from consuming apple cider vinegar, but you do not want to stop taking it because of health or culinary reasons, you may be able to counteract the acidic effect of the substance with dilution. Certified nutritionist and Bastyr University Professor Jennifer Adler states in a 2010 "Vegetarian Times" article that adding 2 teaspoons of apple cider vinegar to 1 cup of water will dilute the acidity enough that it should not harm you while it still delivers positive effects, such as blood glucose control. The Hazardous Substances Data Bank of the National Institute of Health reports that some human exposure studies have shown acetic acid consumption to lead to heart burn and constipation, which may in turn cause related stomach pains. In one 1998 case study, a 28-year-old woman who drank around 8 ounces of apple cider vinegar every day for six years developed potassium deficiency, medically known as hypokalemia. One side effect of hypokalemia is constipation. If you take supplemental tablets of apple cider vinegar, your stomach pain may be the result of the unknown pill contents. In 2006, a reported case of esophageal burning from apple cider vinegar tablets led University of Arkansas researchers to test eight sample tablets from different vendors. Some of these tablets contained acetic acid concentrations that were three to 10 times as strong as table vinegar, and the suggested dosing was up to three times per day. The researchers concluded that apple cider vinegar tablets may be unsafe to consume because the FDA does not regulate their contents. University of Arkansas: Apple Cider Vinegar? Or Just Acid?